This post is a special continuation on the previous Mazda Mega Gathering 2013, which highlight nothing only but RX-7s that exist on the local streets of Malaysia. Either you're a 7 fan or not, I am sure you'll enjoy the varieties, the uniqueness & the colourful rotary machines of Mazda. Even though, there were like 33 RX-7s that came for the Mega Gathering, this number is just a fraction of all the RX-7 in Malaysia. I believe there are more RX-7 owners from other regions and they couldn't make it to the event. Nevertheless, let's have a look at almost all of the RX-7, specifically the FD3S model that I came across at Sepang Circuit! FD3S or just FD, is the 3rd generation RX-7 by Mazda and it was introduced in 1992. During the 10 years of the production, many versions of the FD were produced like the Type R, RS, RZ, A-Spec and finally. the most powerful one, Spirit R.
But, what made RX-7 so special? This is because RX-7 had been the sports car model for Mazda and its '7' legacy was being continued on since the 1st generation 1978 RX-7 (SA22C), it was very successful model in sports car history. In late 1980s, Japan economy was reaching its peak allowing many car manufacturers to produce high-tech sports car for the higher market and RX-7 was made in this era together with other famous ones that you know today like the Toyota Supra, Nissan Skyline GT-R, Honda NSX and Mitsubishi GTO. Instead of common piston engine, RX-7 lineups used Wankel rotary engine. 1.3L 13B-REW used in FD3S is a twin-turbocharged engine known for its lightweight, high outpu and linear power delivery. Rotaries produce very unique engine sound. Click here to hear it. The early FDs had 252hp, while the later model (from 1999 onwards) had an upgraded output of 276hp. RX-7 was recognised as the best driver's car among its piston-engined rivals because of its impressive handling and balance. Thanks to its lightweight chassis and 50:50 weight distribution. Global sports car market collapsed in the mid 90s due to economic recession and it stopped the export of RX-7 to other countries. Its high emission rotary engine also could not fulfill new regulations. But, it remained on sale in Japan until the production came to an end in late 2002 and replaced by the non turbo RX-8 model. 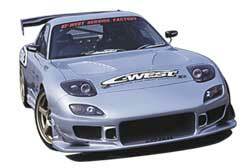 There are many RX-7 bodykits to choose from in the market to stimulate its look. RE Amemiya, CWest, FEED, R Magic, ZestyRacing, PanSpeed, Tamon Design, Abflug and VeilSide, are the ones that I know of. ... and installing tall GT wing to keep the slippery rear wheel drive car in grip. Yesh! Those who watched Fast & Furious: Tokyo Drift would immediately recognise this special RX-7 appearance. It is a full conversion bodykit made by Japanese aftermarket company, VeilSide. This stunning bodykit is known as VeilSide Fortune. There were like four VeilSide Fortune RX-7 at the gathering. Each in different colours. RE Amemiya AD GT bodykit is probably one of the most preferred conversion here. I spotted many FDs wearing it. Personally, I liked the whole package, from the front skirt, to the side canard and extended fender, and the rear diffuser, plus other finishing touches like the carbon GT wing and carbon hood duct. This dark blue RE Amemiya RX-7 from Raydiance Motorsport was once spotted promoting for KIXX Lubricants at the Auto Salon Night event 2 months ago. Check it out here! Mr David Ho (Current President for RX-7 Club Malaysia) also fitted the aggressive Amemiya bodykit onto his FD, while keeping its pop out headlights. Similar styling was also applied on this green FD! Minus the GT wing. You've gotta love how the upgraded RX-7 looks from behind. More downforce, please! In previous post, I mentioned about Mr Woay Chee, being the partial owner of the two extreme FDs. Well, actually his company MizuumiBid2U Pro Shop sponsored and prepared the machines solely for track purpose. The light grey FD is wearing AD Facer 9 kit, easily recognised for its fog lights and fish mouthed front lip. with 18" Gram Lights 57D white 6 spoke wheels by RAYS Engineering. Mr Woay Chee did say both cars are still in the process of setup/tuning and we ought to see the rotary twins more frequent after this. Many thanks to RX-7 owners for bringing their car out, allowing me to photoshoot them. I really enjoyed it! A little more pictures below. Enjoy!